Bruce's friend J.D. came to visit for a week from Kansas. 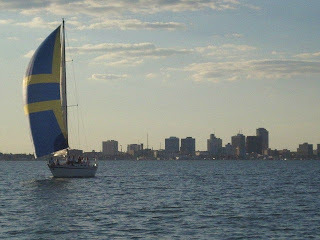 We tried to go sailing but a cold front blew us off the bay on Saturday leaving it too cool and windy to sail comfortably today. So... we decided to be tourists! We bought tickets to board the USS Lexington. It's a carrier beached just across the Harbor Bridge from Downtown Corpus Christi. We've sailed in and out under her watchful eye for years. It has been a long time since I toured her and it has changed quite a bit since those early days. Poor Bruce had to participate in all of my childish... no - YOUTHFUL antics. We had to glare some little kids down so that we could board this baby. Here he is doing his best to look like he's enjoying it! There are stations in the main hangar area where you can play with mini flight simulators. I tried 3 times with this game. You're supposed to land the plane on the carrier. I blew it and crashed violently every time before giving up and passing it to that little kid you see lurking in the background. I didn't hang around to see how he did but it couldn't have been worse than me. There was a spectacular view of our own sparkling CC Bay. We enjoyed the sights from our vantage point protected from the cool winds. The hanger was still pretty chilly as the wind was drifting in from the front door and escaping through these open bays. We watched a movie about fighter pilots that left us wondering how they ever get anyone to agree to that life. I formed a new respect for those young men. We then began our tour of the different areas open to the public. All were reached by going up or down these steep and narrow stairways. It took a little getting used to and it was a good thing that we went up first. We made our way out onto the flight deck where the winds were blowing. These flags were waiving furiously while we tried to stay in the shadow of the bridge as we enjoyed the panoramic view of our Bay. It was sparkling in the clear dry air. We could see where the ships traversing the channel were churning up mud and the waves generated by the winds were stirring the bottom. We walked forward to the very front of the ship. There were walkways jutting out forward for what reason... I'm not sure. I walked out onto one where I could turn and see the front of the ship where the anchors were dropped from a deck below. It seemed a long way down to the water's surface and I got a little freaked out before I made it safely back to the flight deck. I was grabbing onto this railing white knuckled and taking very deliberate steps. It was quite a relief to reach the solid safety of the upper deck again. We made our way back to the stern pausing to look at all of the planes they had on display. Some were genuine and others were replicas. Oh, here is a birdie! I have no idea what he was but he was pretty. Just sitting there on that tail taking it all in. J.D. worked for decades for Boeing and many of these planes, he knew lots about. It was interesting hearing him talk of the narrow margin of error in putting these jets together. He said that they spent hours combing through them looking for loose screws or metal shavings that could cause havoc when these planes began rolling in the sky. He said that they took them out and turned them upside down and shook them to see what fell into the glass bubble. We made our way up to the bridge where we played around with the engine and rudder controls. The Captain would be in the front where he could see all around,and would call back course changes to the person standing here with no view at all. From the Captain's chair, the view was great and I was treated to watching this ship make it's way across the bow towards the Gulf. It looks pretty small from up here. We had an unexpected treat when this man, John Hayley, came in exclaiming that it was all still the same as it had been when he spent two years on this ship beginning in 1960. He was flattered when I asked if I could picture him in my Blog. He told us yarns from days of old as we listened spellbound. You could tell he was getting a kick out of all of the attention. He showed my boys how it was all done and explained what would happen if we lost steering from here. Someone in the back of the ship would take over and the orders were relayed by the "phone talkers". There was a very strict standardized jargon that was used in all things. He told of how they played a trick on a newbie one night where they all pretended that they had lost the rudder and scared the poor guy witless. He told of near misses with other ships in the night. We left him on the bridge to repeat his stories to the new bunch of people who walked up and lamented having missed it the first time around. We carried on through the chart room, where Bruce perused the charts to plot our pretend course until I dragged him onward. We made our way through the crew's quarters where I tried out this not-so-roomy bunk. I can not imagine living like this for any length of time, let alone the months on end the crew endured. These bowels had no AC and John had told us that as often as not, they slept on deck to escape the heat. Most of the areas of the ship were windowless and those with windows weren't much better. Nice view but little function otherwise. We made our way to the common areas of the galley, where we could see where the cooking was done in the stainless steel garden of giant overgrown bowls and cauldrons. I wonder how many years this label has gone with "steam" misspelled. Too funny! After leaving the crew areas behind, we made our way to the forward part of the ship again where we found the anchor chains. They were huge and I once again, force my poor husband to play around with me. We could see down into the anchor locker and where they dropped out into the water. The lines were all looped up inside a storage area that kept them from becoming tangled. I can't see how that could happen, they were massive and weighty. This pic is actually taken on the fantail of the ship, but it's the same lines. We found some more "museum like" exhibits in the open areas on the mid-ship deck. There was a Pearl Harbor exhibit, and another one with memorabilia from the movie of the same title that was partially filmed using this ship. Bruce could have spent days here... I had to keep ushering him along. We spent some time checking out this wall of knots, which had another wall showing what each knot was. I feel a new hobby coming on. Some of them were quite intricate and beautiful. I know I could do it! Next, we toured the engine room. It was a huge cavern filled with tubes and turbines, gauges and valves. Bruce and JD were trying to figure it all out. I can only imagine the heat that this room held back before AC. How did people survive? We cruised by these torpedoes on our way towards the fan tail. There was an exhibit showing how they were assembled and I remembered the movie we had seen earlier where they exploded into fire balls. Imagine having to work around these with the ship tossing around. We finally made our way back through the main hangar area to the fan tail deck where we saw these huge wenches made for helping them secure the lines ship to shore. I'm sure this is the biggest winch this wench will ever see. We stopped near the exit to play with this gun. It was actually able to move by turning these handles. Bruce was pouring over it trying to figure it out whilst I was taking aim at a poor unsuspecting pelican on the shore. I missed him though and we went on our way. We cruised over to the nearby eatery, Pier 99, where we had a giant hamburger and onion rings glistening with grease! Ahhh it was good. What a way to wind up a tourist excursion... Next time the weather is inclement, it's the Aquarium! Hooray for Daylight Savings time! This was the first Wednesday night race after this year's time change. We're so glad that the sun is out for the whole race. There was a pretty good turnout for the race today. Boats jockeyed for position at the start and the traffic got fierce! Mark and Brenda joined us. Brenda is off work for spring break and she and Mark are spending the week on their boat. They sailed back to CC from Port A just to grace us with their presence for today's race. Brenda joined Clay on the foredeck. Bruce has been coaching her and she's got it down. We were 4th start as we decided with all the crew... we would fly the spinnaker tonight! We milled around and tried to stay out of the way of the other boats at their starts. We had good position on our start. These boats were our competition. Before we made it to the gap, we were overtaken by several boats that hadn't had such good start position. Oh well... we'll get 'em later. We had to tack to the Gap, which is unusual for CC. It always makes thing exciting when the winds are blowing from the wrong direction. 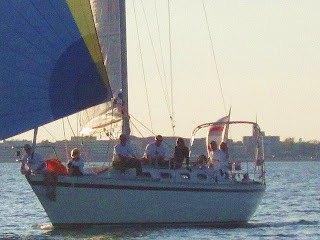 We all put our spinnakers up just after we left the Gap behind. Bruce had packed the spinnaker using these cheap little white yarn pieces... unfortunately they didn't want to give it up! The guys had to really yank it to get the yarn to break, freeing the sail to fill completely. 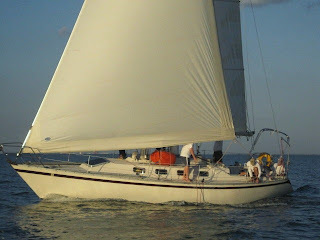 Once we got it set, Bruce called for all hands to head to the foredeck except for myself, at the helm, and Krystle, who was trimming the spinnaker sheet. We began at the back of the pack, then slowly, we started to walk up on them. All boats but one had chosen to go up to our port... Doug chose to go low. Maybe Bruce would have followed suit had he been on the helm, but since it was me, I just headed towards the mark. We got some good winds in the middle that died out again as we reached the mark. It was amazing. Bruce was incredulous as we made our way up through the field. The skipper from another boat began shouting good naturedly at us. as we took advantage of some force unseen and unfelt by the rest of the sailors. It was a spectacular feet! Bruce was thrilled. We were the second boat to reach the mark and rounded with plenty of space. I stayed on the helm while everyone set the sails. Then Bruce came back to take his post for the weather leg. Unfortunately, we didn't do quite so well on this portion of the race. But it was OK, we had proven our worth to the pack! We had a beautiful sail back to the Gap, with the remaining daylight well appreciated by all. This week, the sunset was near the end of the race. Hooray! It sounds like such a simple thing to others... but to us, it's everything. It means that we can fly the spinnaker with a pickup crew. It means we aren't shivering. It means Spring is coming and life is good! Bruce left me at the helm to set the sails so that we could go wing on wing inside the Gap. This is also unusual. I didn't mind. I enjoy being at the helm for the finish! We cruised in over the line, but not before we had to do a jibe. Fluky winds! We discussed it for a bit, thinking it would take too long and cost us time in the long run. Steve convinced Bruce we could do it, and he was right. The crew popped it in and we were off! We picked up a bit of speed to cross the finish line. We had done well, and had a great time! Thanks to our friends for joining us. We are truly lucky!